Sleepy Hollow: This Is War. Previously on Sleepy Hollow: Bad Blood. I am so glad that this show is back on our screens, and I love, love, love this season premiere. It throws us for a loop right off the bat — makes us believe that Jenny and Katrina are dead, which… no, the show would never do that to us, not like this. And indeed, it’s only a trap. The reality is, in some ways, even crueler than that, but it has its perks. This first episode of the second season is a tour de force, and it’s magnificent. It’s a wild ride that picks up right after Katrina was captured by the Horseman of Death and Henry revealed himself to be the Horseman of War to his father. Ichabod vows to Abbie, who he was forced to leave behind in Purgatory only hours before, that he will return for her, and it’s amazing how these characters (and the actors and actresses who play them) immediately draw you into the world of Sleepy Hollow again. I fell right back in love with the bond between Ichabod and Abbie, with how the earnestness of their affection combines both gravitas and incredibly lightheartedness and, chiefly, easiness. They don’t hold back, instead they hold onto each other tight. And Jenny, too. Crane’s part of the family now, truly. And that’s what makes their scenes carry weight and meaning even though they were short and far between, and it’s what makes them work even within such a fast-paced episode. 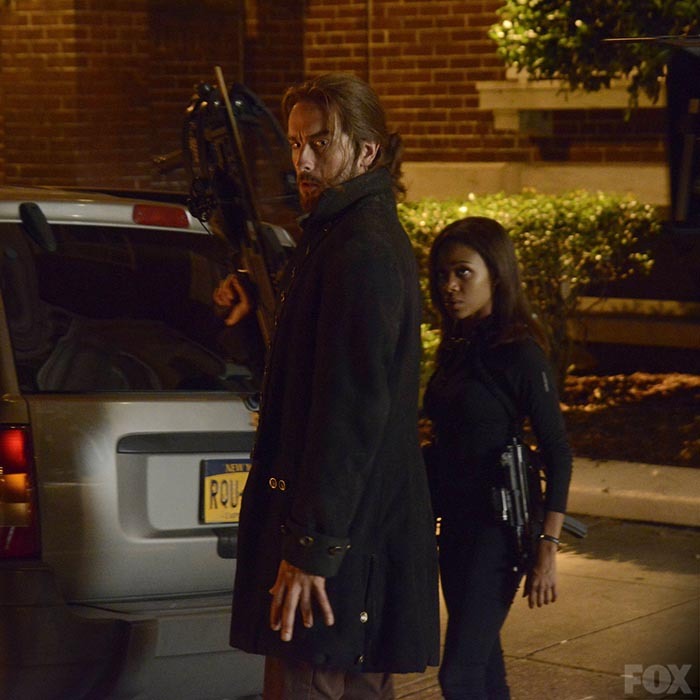 Not a lot of shows can pull this off, not on a season opener, but Sleepy Hollow has returned on top form. Oooh, classic abuser/framing yourself as the other victim/brainwashing/remodelling the real victim’s feelings into something else rhetoric. This episode serves as a brilliant set-up for the new arc of this season: Moloch may have been thwarted temporarily, but with Henry’s flaming sword and suit of black armour, he’s got another iron in the fire (pardon the pun). The second Horseman has arrived on Earth, and even though Abraham will be preoccupied with Katrina for a while, it won’t take forever until they combine forces. But the Witnesses are fine, and they have an army, too. It’s small, granted, but it’s got heart and soul, and fire and brimstone. Man, am I glad to have them back. Now we’ve just got to get Katrina back, bust Captain Irving out of whatever they stuck them in (the mental institution, going by early promo pics), and we’ve got one hell of a team together to stop the Apocalypse. (Also, if Katrina and Ichabod are reunited: domestic Cranes on missions!) Who knew the Book of Revelations could be so much fun? Next on Sleepy Hollow: The Kindred. PreviousScott & Bailey: Series 4, Episode 2 (Tough Love).